We worked with an agent about 60 days in advance of our arrival. This was nice as everything was ready for us when we arrived. Friends arrived without advance notice and the same agent was able to get the same permits in about a week while they stayed in Wreck Bay. This was at the end of the season when he wasn't too busy. On the advice of other cruisers (see Soggypaws.com on their excellent Galapagos information package) we choose Bolivar Pesantes as our agent and would highly recommend him. His English is less than stellar, something to keep in mind when contacting. If you use this agent, you arrive first at Wreck Bay, Puerto Moreno on San Cristobal Island. We chose to get an Autografo which allowed us to visit 3 islands: San Cristobal, Santa Cruz and Isabela and stay up to 2 months. If you do not have an Autografo then you must stay in only one anchorage and I think the maximum is 20 days. We are very happy with our decision as all three islands had something special to offer. To apply for the Autografo in advance we e-mailed Bolivar copies of our passports and ship documentation. We had our Spanish speaking daughter call to confirm he'd received them as we'd heard nothing from him and he said all was in order. When we arrived in Puerto Moreno, San Cristobal we called Bolivar and within 30 minutes he arrived at our boat with the Port Captain and the Customs official by water taxi. They filled out some papers, asked what fresh fruit, vegies, plants or animals we had on board and had some cookies and Coca Colas. In about 15 minutes we were all checked in. This was on a Sunday. The Galapagos requires a fumigation certificate. We obtained ours in Panama at a cost of $100 (we heard others paid as little as $35). It doesn’t seem right though, since we got the certificate but no one ever visited our boat and no fumigation was done. If you do not have this certificate we have heard that it can be arranged in Galapagos for $100-150 and they actually visit the boat. If you want to visit any location within the Galapagos National Park, which is the vast majority of the Galapagos including the best sites, each person needs a pass. The next day Bolivar picked us up at our boat in a water taxi and took us to immigration. To check in with immigration you need color copies of your passports and the boat documentation. Bolivar has a color copy machine at his house and made these copies for us. He also made all the copies we needed to check in and out of Santa Cruz and Isabela. You can purchase diesel fuel in Puerto Moreno on San Cristobal. It is illegal to buy fuel at the local price (around $1 per gallon) but with an approval from the Port Captain it can be purchased to about $2 a gal using your own containers and a local taxi. Bolivar (actually his son, Bolivar Jr.) will also deliver fuel direct to your boat, using his fuel containers. The cost depends on the quantity and is between $2.50 and $3.50. If you have the Autografo and leave Puerto Moreno for Santa Cruz you need a Zarpe from the Port Captain. Again, Bolivar did all this for us. We left on a Sunday so had to pay the overtime fee of $12. During normal business hours it’s $6. Leaving Santa Cruz requires a Zarpe to Isabela, cost $12. Since there is no Immigration office on Isabela you need to check out with Immigration on Santa Cruz. For the three of us it cost $15. Bolivar had prepared everything we needed in advance, including copies of our passports and ships papers, and put it in an envelope to give his associate in Santa Cruz, Ronny Sanchez (953 (0) 99 522 712. There was no additional cost for Ronny, just a Coca Cola. Our last port was Villamil on Isabela Island. It’s a wonderful, protected anchorage which looks roomier than it is because of all the rocks not seen at high water. Checking in at the Port Captain’s Office was easy but took a couple of days. Once again, Bolivar had prepared an envelope addressed to the Port Captain with all the required documents. We gave them to the office but were told to come back the next morning to check in. The next morning we were told to come back at 2 pm but then were told to come back after 3 pm. Other cruisers said they had tried to check in for a several days. At 3:00 on the secon day someone was there and checked us in, cost: $4.01. We had heard from other cruisers that getting the departure International Zarpe could take a few days or longer if the internet was down. We figured we'd start the process a few days before we actually wanted to leave so Monday morning we requested it. The official filled out some forms, located those from Bolivar, charged us $12.87 and gave us the International Zarpe. He needed additional copies of our passports and Autografo (Bolivar only supplied one set) so asked that we bring them to him ASAP. We did. It was simple for us but 5 other boats had stories of both check-in and check-out taking at least two days. We did a number of tours on each island from $35-$60 per person. The Galapagos are not the cheapest islands to visit but they are incredible if you like seeing and learning about creatures not found anywhere else in the world, snorkeling and diving with sea turtles, rays and sharks, and exploring magnificent volcanic landscapes. We feel very strongly that all cruisers should follow the rules and regulations of the Galapagos National Park. They are in place to protect the flora and fauna of these incredible islands. We met cruisers who did not have an Autografo but planned to stop at the different locations anyway. 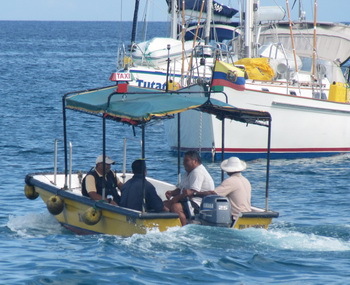 Other cruisers went to some of the beaches and visitor areas in their own dinghies when it is prohibited to do so and to go without an official guide. We know how tempting it is...we were anchored only a couple of hundred yards away from a penguin colony, a short dinghy ride. In the past the Galapagos Islands have been difficult to visit by yacht and with high fees and many restrictions. Currently they are allowing yachts to visit three islands. If we cruisers do not follow the regulations it may make it more difficult or even impossible for yachts to visit in the future. Please follow the rules. Pleading ignorance is no excuse.